Gandhi Ashram Trust (GAT) is a philanthropic development organisation working at Noakhali. It is working since 1946 with Gandhian philosophy of rural development, peace and social harmony. Since inception, GAT is working for the rural poor, specially for women, in the en­circled area of the Ashram. It has two prong func­tions of development and charitable activities. 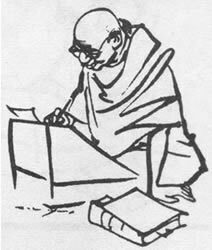 The goal, objectives and activities of GAT are derived from the core value of Gandhian philosophy and guideline. At present GAT is working for 5 Upazillas (sub-districts) of Noakhali, Lakshmipur and Feni District. It is working directly with 25000 poorest families of the area. The establishment of Gandhi Ashram trust is rooted with the 'Peace Mission' of Mahatma Gandhi immediately after the communal riots in 1946 at Noakhali. Gandhi stayed for about four months in the riot stricken areas. He started moving around the villages and motivated the people towards his peaceful coexistence and non-violence philosophy. When Gandhiji came to Jayag on 29th January 1947 all sections of the local community extended him whole-hearted support. At that time, Barrister Hemanta Kumar Ghosh of the village donated all his resources to Mahatma for the development and peace of the area and "Ambika Kaliganga Charitable Trust" was formed. The office of the Gandhi Peace Mission, formerly known as Gandhi Camp, was shifted to the present campus of Jayag. The Gandhi Camp started working for both peace and charitable functions and it continued till partition of India. After the partition, specially after the assassination of Mahatma Gandhi, except for a few most of the Gandhi followers left Noakhali. The non-secular government of Pakistan started oppression of the Gandhians and majority of them were in Jail for almost the life time of Pakistan. The properties of the Trust were forcefully taken away by some land grabbers and anti-social elements. It was not possible to continue the ac­tivities of the Trust. The team manager of Peace Mission Mr. Charu Chowdhury was detained in jail for several times and finally for 1963-71. He was released in 1971 after independence of Bangladesh. Charu Chowdhury started re-organising the Ashram in the newly independent Bangladesh and freed land properties from the land grabbers. It took final shape with the Gazette notification of Bangladesh Government on 2nd October 1975, where "Ambika Kaliganga Charitable Trust" was renamed as "Gandhi Ashram Trust". A committee with representatives from both Bangladesh and Indian Government was formed to run the activities of the Trust. In the initial stage, Ambika Kaliganga Charitable Trust decided a charitable role and started working for the riot victims of Noakhali. The victims were rehabilitated in their society and relief functions were carried out. Besides, motivational works for communal co-existence were taken after the separation of India. In the Pakistan period, the Trust could not continue its activities due to the policy of the then Government. After the Independence of Bangladesh, with the emergence of Gandhi Ashram Trust, there was a shift in the vision and mission of the Trust. Development and extension services for the poor and disadvantaged class were taken into consideration along with charitable function. Now a days, development of life standard, both in material and eternal sense, is the main focus of Gandhi Ashram Trust (GAT).